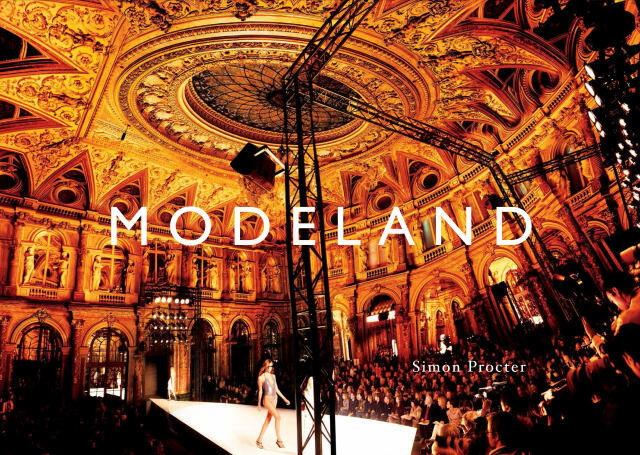 Modeland by Simon Procter is a compilation of a large body of photographic work spanning several years. It is a unique documentation of fashion and fashion shows. Modeland was also the first major project by the photographer and began his long relationship with the influential New York Magazine editors Stephen Gan and James Kaliardos of Visionaire. The work in Modeland has been exhibited in Colette Paris and is held in major museums and collections worldwide. Documented runway shows include Armani, Chanel, Oscar de la Renta, Diesel, Christian Dior, Galliano, Jean-Paul Gaultier, Givenchy, Kenzo, Christian LaCroix, Fatima Lopez, Marc by Marc, Stella McCartney, Alexander McQueen, Prada, Valentino, Viktor & Rolf, Diane Von Fürstenberg, Louis Vuitton, Y-3 and YSL. Designers include Giorgio Armani, Alber Elbaz, Karl Lagerfeld and Donatella Versace. Models include Laura Blokhina, Morgane Dubled, Lindsay Ellingson, Heloise Guerin, Chanel Iman, Alina K., Maria Kashleva, Angelika Kocheva, Thana Kubnen, Anna Kuchkina, Irina Kulikova, Kate Moss, Heidi Mount, Olga Sherer, Lekeliene Stange and Daria Strokous. Foreword by Didier Grumbach, President of the Féderation Française de la Couture. Full-color and black and white photographs throughout.